The home page of our website, www.vivasafaris.com has videos taken by guests of two lion kills. These videos were taken in July 2012 and July 2013. I was hoping that we could make it 3 out of 3 with another video for July 2014. No such luck ! I understand that our clients did see a Cheetah kill this month and there were a number of times when our guests saw lions eating their kills. All in all, it was a great month of game viewing. 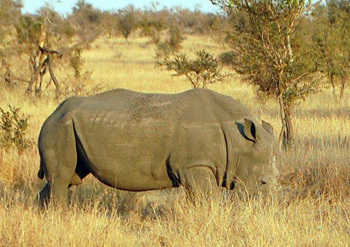 Our guides report that Rhino sightings were better than in June – I am not sure why. What I am sure of is that our SA government is trying to accelerate the extinction of the species. The relevant Minister is deliberating the issue of legalised sale of stockpiled rhino horn. Clearly some individuals stand to make a whack of dollars (or more likely Yuan) if the CITES ban is lifted. The old cliché applies (as I have said before in my newsletters) : “the love of money is the root of all evil”. I have no academic degree in commerce but it is abundantly clear to me that the Chinese are the new economic superpower. When I speak to guests from all over the globe, I am told that the Chinese are buying up whatever is of value throughout the world. Large tracts of land, big mining houses, huge shopping malls etc etc are all being bought by the Chinese. Can our minister not understand that every single gram of Rhino horn that is put on the legal market will be snapped up in an extremely short period of time ? And then what ? Having whetted the appetite of so many more rhino horn users, not just in China but also in other nations such as Vietnam, the demand for additional rhino horn will not decrease as some of the ignorant may believe, but will instead reach unprecedented heights. The conclusion that any logical-thinking person must reach is that the Rhino will be extinguished. Please, God, ensure that the CITES ban remains intact ! I encourage all like-thinking readers of this newsletter to write to the press in your countries and let them know how you feel about legalised trade in rhino horn. During the bush walk we approached two big bull elephants feeding along Olifants River. One of the elephants saw us getting close and stopped feeding. It was little unhappy about our presence. The other one kept on feeding and moving around. On the other side of the river there were small herds of giraffes, zebra, impalas and baboons feeding as well. The elephants moved away from us and crossed the river. It was awesome to see Elephants swimming and walking in between the hippos and crocodiles. One of the hippos was outside the water. It was forced to retreat by the largest mammals on land. On our way back to the open Landcruiser we found two giraffe feeding along the road. We stopped for a break in the middle of nowhere to listen to the sounds of Mother Nature and we heard an African fish eagle calling – a truly beautiful African sound. There were two of them on top of a tree. We witnessed one fly in to the water to catch a big fish. He took it up into a tree and started to eat it. Our very first sighting was of a leopard walking along the road for couple of minutes. Our guests took beautiful pictures. Along the way we saw lots of general game like Impalas, Zebra, Giraffe, Kudu and as the sun sank, a lovely Bushbaby. We arrived at Marula Boma and everyone was happy about having a Braai (barbeque) in the bush. After a few minutes, some elephants came to join us for dinner. Everyone was happy and enjoyed watching the elephants close by, without a fence in between. One lady kept on looking at the rifle which we prop up against the Marula tree. We met with our guests early in the morning for coffee, tea and rusks. Before we left the lodge we heard lions roaring outside the lodge and we left immediately to look for them. But we only saw spoor. We continued driving towards our walking spot. We left the open Landcruiser very quickly so we could see the sun rise. A few metres from the vehicle, just as the sun was rising, we found a Black Rhino hiding behind the bush. It was difficult to see it clearly at first. It tried to charge us, but we did not move at all and it stopped very close to us. It was a very scary situation and a good experience for us and the guests. We arrived in time for high tea and Shadrack took us on a game drive. Our first sighting was of two white rhinos and we spent half an hour watching them grazing and rubbing themselves against the tree to remove mud and dead ticks. We then drove straight to an area where lions had killed a baby giraffe. When we arrived at the spot there was one lioness next to the carcass to make sure no jackal, vultures and hyenas came to feed on it. The male was sleeping a few metres away and there were 5 adolescent cubs. As the sun set, the cubs moved towards the carcass and started feeding. It was interesting to see the lions feeding and vultures waiting up in the trees and jackals running around hoping to get something to eat. 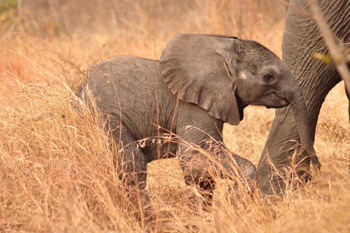 The Kruger National Park once again proved to be a haven for great animal sightings. The leopards remained as elusive as ever with only a few good sightings this month. However the cheetahs came to the party with a few good sightings along the Orpen road towards Satara as well towards Timbavati. With water becoming a scarcity in several areas across the park, the big dams such as Nsemani have become a great place to view animals – especially big herds of elephants, buffalo, impala and zebra. This has made Nsemani dam a hot spot for lion activity. The majority of my highlights consist of close up views of the big five, except for a few exceptions; which include southern ground hornbills and the cheetah. 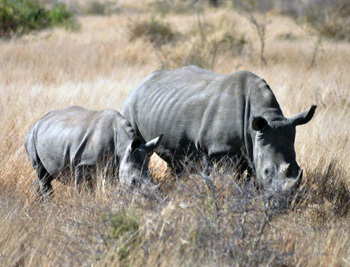 The rhino sightings have been great this month, one of my favourites took place near Ngotso dam. After lunch at Satara rest camp I decided to visit Ngotso dam, one of few water holes which still has a fair amount of water. On the way to the dam we came across an array of animals, such as large male kudus parading their huge curly horns, while eating the last few leaves left on the trees. A few large bull elephants emerged from behind the bushes, chewing away at bundles of very dry looking grass. It was as we got closer to Ngotso dam that I picked up the form of four very exciting shapes in the distance – there they were heading towards the dam – four big White Rhino in the distance. We sat watching them as they slowly moved towards the water, in no rush whatsoever. My guests were very happy to see so many at one time – a really great sighting. Lions are always exciting to see even if the majority of the time they are lying flat on their backs with their paws in the air. It was a waterhole once again that provided me and my guests with a close up view of two big male lions. While heading along Orpen road towards Satara, I got a very promising update from a passing car – it was lions. It wasn’t long before we were pulled up alongside a pair of very lazy lions, their bellies full and paws in the air, enjoying the shade of a knob thorn tree. When a small herd of impalas moved across within the lions’ view, we realized these lions are really light sleepers, as they suddenly raised up their heads and gazed with hungry eyes at the impalas. Lazy lions, relaxed after a good meal, look towards impala herd. The cats are always a great spectacle and none so more than the cheetah, not part of the big five but definitely one of the more impressive creatures. It was coming to the end of the day and we had just left a lion sighting at Nsemani dam, so we were all pretty happy. It didn’t take very long before we had stopped again only this time it was to admire a stunning cheetah, positioned beautifully alongside a tree surveying its surrounding, possibly looking for dinner. My guests could not believe their luck – what a fitting end to another great day in the Kruger. Not all the good sightings involve the big five – it’s sometimes a good bird sighting that’s really interesting. A personal highlight for me and my guests involved a particularly hungry southern ground hornbill. I always tell my guests how they love to eat tortoises, and finally I had proof. There in front of us was a very unfortunate tortoise, being devoured by the hornbill, that big beak smashing down on the shell, showing its power and proving its definite liking for tortoise meat. During a drive in Kruger National Park we managed to see two leopard cubs that seemed to have been abandoned on a rock along the dry Timbavati river bed. We had a good visual of 5/5. The cubs looked to be about six months old. While driving on the S100 we saw five lionesses on a hunt. We were near the Shobotwana windmill. There were wildebeest close by. The wildebeest spotted the lionesses and started warning one other. The wildebeest were very lucky and managed to get away before the lionesses got close to get one of them. We also managed to see a breeding herd of elephants. While viewing hippos and crocodiles at Nsemani Dam, a hooded vulture landed on a piece of wood and started to drink water. While he was drinking water, a fish eagle swooped down and started pecking at the eagle’s head. The fish eagle continued doing this until the vulture decided to fly away. The fish eagle then perched himself on the piece of wood and started to drink water. As the day progressed we came a across a White Rhino. He was alone and we spent a couple of minutes with him. We were hoping that he would make his way to a more open clearing but then after a while he headed towards the thick bush. My guests were very happy to see the rhino in its natural habitat. On the S40 we saw two male lions that had just finished feeding. Close by was a dead lioness. Everyone was busy trying to guess what had happened to the lioness. Maybe she had died during the hunt. Along Tshokwane road we saw two cheetahs walking on the burnt plains. One of the cheetahs was limping and he appeared to have an injury on his hind leg. During the afternoon drive in Balule we managed to locate a male lion near Tremisana Lodge. 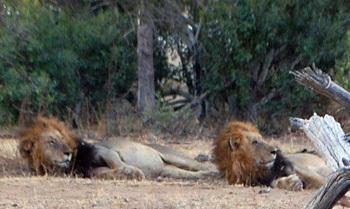 Male lions scavenge just like hyenas. The lion had just finished feeding on an impala. We found him lying down relaxed next to the carcass. 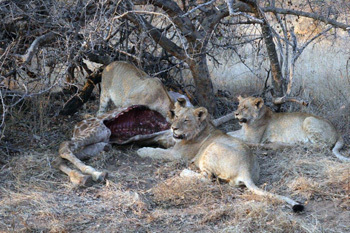 The kill was the work of a lioness that had been unfortunately chased away by the male lion. At Girivani loop we viewed a large herd of breeding of eight hundred buffaloes. A lioness was spotted following the buffaloes. The lioness eventually pounced on the back of a female buffalo behind the bushes. The noise made all the buffaloes turn around and start chasing the lioness. They chased her for about fifty metres. At Nsemani dam we saw an older crocodile chase a younger crocodile for about ten metres on the edge of the water until the young crocodile swam into the deep water. Later that day we had a great sighting of a male cheetah with a steenbok kill located on S31 ten metres from the road busy feeding and checking around for other bigger predators which might take over the kill. 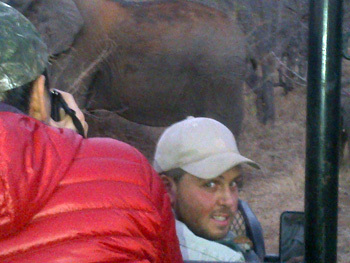 Hello all, my name is Adam and I am a new guide working at Viva Safaris. My first month here at Viva has been fantastic!! My previous job I was working in the Timbavati also part of greater Kruger where we had some good sightings. Balule I can tell you already just after my first month is no different, the sightings are just as incredible. I would however be lying, if I didn’t tell you I already knew Balule was an amazing reserve, I know it very well because it is the same reserve I trained to become a nature guide, four years ago at Campfire Academy. I really enjoy the guests and my co-workers and I am settling in very well here at Viva Safaris. At my previous job I was only doing driving safaris. What I really like here at Viva is the walking safaris. Although you may not get to see as many animals or get as close to them as you would in a vehicle, I much prefer walking, because you can really focus on the smaller more detailed things such as tracks, insects, vegetation, and geology. It is a much different feeling from being in a vehicle and being on foot, especially when you do encounter big or potentially dangerous animals. Bongani and Musa as lead guides and I as their back up, we make an excellent team and already in my first month walking along the river have had some fantastic encounters. Just driving to the walking spot from the lodge to the river in the early morning, we have seen Lions hunting giraffes, buffalo, elephant, wild dog, cheetah and more. On the walks we daily encounter Hippos and big Nile crocodiles in or around the river as well we usually see giraffes, kudu, impalas and baboons. We have also had some really special sightings with black rhino and elephant on foot!! I have really been enjoying the afternoon and sunset drives! The sightings have been amazing!! The afternoon drives usually start off slow and then pick up towards the end of the drive, I have seen very nice birds, a lot of giraffe and general game, and had some pretty amazing elephant and buffalo encounters. The sunset drives have been full of good sightings, and it’s a good first impression of the African bush for guest. I had one evening on my sunset drive a beautiful male lion feeding on a kudu kill that he stole from a leopard that stole it from two cheetahs and 10 meters away from the sighting my vehicle’s battery goes completely flat on the sighting!! I can tell you this much, it can be scary using a small head torch to look into the darkness of the African bush and just see the yellow glare of the eyes of a big male lion. In the end the problem was fixed and my guests I think will all remember their first safari as a memorable one. That is only one of many amazing encounters on the sunset drive, I have also seen my first side striped jackal – quite a rare sighting along with white rhinos, leopards, lions mating, big herds of buffalos and elephants, chameleons, owls, genet, and more. My first month I have really enjoyed a lot and the people and guests I work with are fantastic. I have had guests from all over the world, and really enjoy swapping stories and teaching them about the nature of Africa. I really enjoy the staff I work with; everyone is so friendly and welcoming and they have all really helped me out a lot with learning the protocols here at Viva Safaris. I love the wildlife and the work environment here at Viva and look forward to a long future here. Today had started like all the days before it with all my guests eagerly awaiting for their day in Kruger. By the time we got to the gate and we rolled the canvas up everyone on the vehicle was a little windswept but before I could even start rolling it up a person coming from inside the park stopped me and told me that just down the road were two female lions with hardly any cars on the sighting (anyone who has been into the park knows that not many cars is a bonus). I rushed a bit to roll everything up as fast as I could. Got all the forms filled out and off we went to start the adventure. We drove not even 5 minutes down the road and true as anything there they were lying not far from the road and we were able to get a perfect view of them just sitting there and enjoying what little sunlight there was. We drove not far down the road again and found a few dagga boys (old bull buffalos). This was brilliant 2 out of 5 before we are even in the park proper so myself and my guests were both happy! We entered Kruger feeling rather excited after a fantastic start. The bush surprised us with a breeding herd of elephant crossing the road right in front of us giving us full views of all the babies and the herd was very relaxed with our presence which made the sighting all the more special. We later bumped into a rhino but it was pretty far off so we decided to carry on in the hope that we would find more. The bush surprised us with 4 beautiful White rhinos who started out rather far away but I assured my guests that if they were patient it would get a lot better and it did with the mother and her calf coming right up to the watering hole to drink with the big male not far behind her. So that was 4 out of 5 !! Without a doubt after having a sighting like that we had arrived at lunch a little later than expected but all hopes were very high after having an amazing start. After lunch we just moved around finding anything we could more towards the lines of general plains game as we hadn’t really seen much of them. All and all it was a very good day for both myself and the guests, the rhinos of course stood out for me the most as I have grown rather fond of them. Just proves that the bush is full of surprises and will always give you amazing sightings if you’re patient. PIERO’S NOTE : I want to congratulate Wesley on photographing the baby Black Rhino born a few months ago on Balule. The Warden and his team were very excited as they had been given a report of lions eating a baby Black Rhino – it must have been another one. Wesley’s photo certainly did the rounds – all landowners, lodges and friends were happy to see the baby was still alive ! On an afternoon drive with Wes, we came across some elephants near Tremisana Dam – they were really close but Wes felt confident enough to take his eyes off them and turn around for the photo. On the second of July I had a bush walk at Marc’s camp at 0600. We were greeted by the chorus of different kinds of birds such as robins, bulbuls, barbets and many more. We walked along the Klaserie River, where we came across a giraffe walking along the fence towards us. 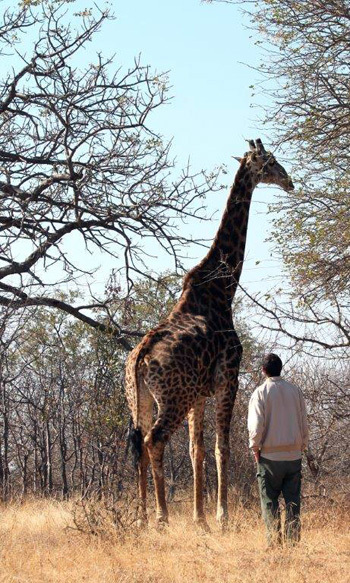 The giraffe sensed danger and walked back. 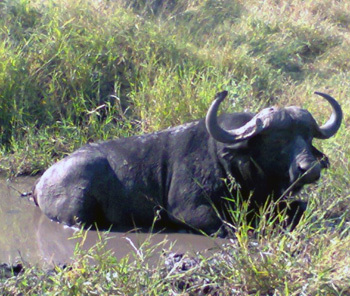 The buffalo bull was lying in the mud. We watched the sunrise and the giraffe from a distance of about 50 metres. We entered Kruger through the Orpen gate at 0900. We immediately spotted three cheetahs from a distance of about 100 metres stalking impala. Most of the areas had been control burns, so animals can easily see danger from a distance. 100meters before the second gate, two young male lions were crossing the road. About 20 km halfway to Satara, giraffes were drinking water from the Timbavati River. There were some baboons around the river as well. The big baboon males were fighting and chasing away the young ones. Female baboons were carrying babies on their backs. At Nsemane dam there were elephants swimming and drinking from the dam. As we were watching the elephants, buffaloes were coming to the dam to drink. We saw the two big fives at the same time. On the fourth of July on the Sunrise game drive, I had six guests. 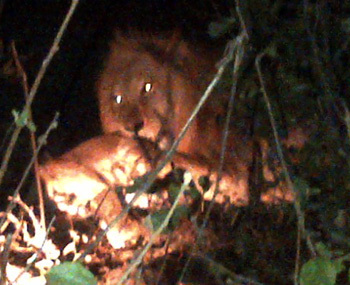 We spotted one male lion and four lionesses at the dam, 100 metres from Tremisana lodge. It was too dark to take pictures. We drove along the Olifants road in Balule and came across some buffaloes lying some 20 metres from the road. About 200 metres into campfire property, six male elephants were feeding on the Marula bark and branches. The dominant male uprooted the tree and fed on the roots. On our way back to the lodge, we passed through the dam again, and only one male lion was still there, lying behind a small shrub. My name is Musa and I have just joined Viva Safaris. I started working here on the 23rd of July 2014. It has been a wonderful experience so far and I must admit I am really loving Balule. My first ever activity was the morning bushwalk and I did it with Bongani. We left the lodge early morning and it was a bit cold. The first animals to greet us were the elephants. We came across a herd of elephants spread out on both sides of Olifants road. Some were leisurely walking about whilst some were feeding on the Marula tree very close to the road. One very young baby was really beautiful. We drove down to the river to start our walk. As we were driving down we started seeing a lot of baboons, impalas. When we got to the river we saw a lot of hippos. We had a lovely bushwalk that day. We stopped for a while to rest and then went back to the lodge. The following day I went to Kruger National Park for a full day safari. We had an awesome sighting of three lionesses north of Satara camp. One rhino bull on the Orpen road busy feeding. We also came across a lot of elephants and buffalos as well as a lot of general game like giraffes and zebras. I have also done some sunset drives in Balule and I have been very pleased to see elephants, hippos, two honey badgers, chameleons, bush baby and many other animals. I have also come across lions and buffalos very close to Tremisana lodge. I am really looking forward to finding my first leopard in Balule. I feel so at home already. I believe the coming month has plenty of surprises in store for me. Tremisana Lodge has had a new storeroom built. Given has been promoted and will be in charge of all male garden and maintenance staff. We have paid for new mosquito nets and eagerly await these in mid-August – time enough before the arrival of the mozzies. They usually arrive after the first rains – sometime in November. We have built a new storeroom at Marula Boma. We will keep all lanterns, candles, ornaments etc in the storeroom. In addition we have built a bedroom that may be used in the future by a full time worker. Marc’s Camp has had an upgrade insofar as we have installed the glass sliding doors and windows. Ronald really likes them and I look forward to receiving positive feedback from our guests. Animal sightings at the waterhole in front of the Tremisana Lapa have been excellent. I am told that we have had late night visits from lions, hyenas and leopards. On one night we had a sighting of an Aardvark. 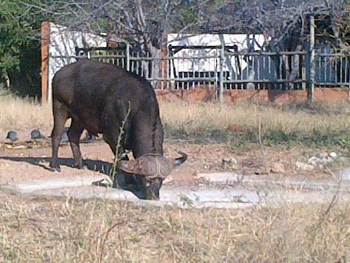 I took this photo of a buffalo bull (part of a herd of six) that drink daily from the waterhole in front of the Lapa. We have added full descriptions of all the accommodation types (treehouses, tented units and brick and mortar chalets) at Marc’s Camp to our website. Some tourists believe that each and every treehouse is located up a tree. Our experience was that the vast majority of our clients wanted en suite accommodation. 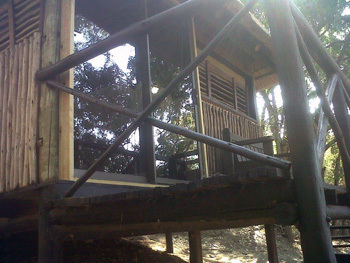 The 3 treehouses that are based in the trees are NOT en suite but have private designated ablutions. It is physically impossible to have en suite facilities for these. All the other treehouses are en suite. These treehouses are not in the trees per se but are built on stilts and are in the tree canopy. Both of the pictures above are of treehouses that are built on stilts. We have had excellent feedback re the glass windows/sliding doors we have introduced. The rustic nature of the treehouses has not been compromised and we are told by our guests that they love to see the sunrise. We have added a lockable gate to those treehouses that can be accessed via the front steps. This has been done so as to ensure privacy. Janetta informs me that no one has requested curtains thus far – so we await the summer to see whether the guests will request curtains then (sunrise in late December is around 05h00). The staff of Tremisana Game Lodge did not spare any effort to give us the time of our lives watching wildlife. The variety was great. We had a sun set safari including bush braai (BBQ under the stars), a bush walk safari, a sun rise safari and several game drives in Kruger National park and a game drive in Tshukudu park. The variety in the program definitely distinguishes the offerings of Tremisana / Viva Safari’s compared to what other lodges offer. The vehicles used are open 4 wheel drive vehicles that give excellent view and photo opportunities during the game drives. The Tremisana lodge is well maintained, nice, cozy and not too big. The rooms are well equipped and clean and the staff is very friendly. If you have time, I would advice at least the 4 day program. We booked with Viva Safari’s and we all enjoyed the trip. On the way back to Johannesburg we paused at the Blyde River Canyon which is definitely worthwhile seeing. This is my third visit to Tremisana, so they must be doing something right!! Booking with Viva Safari’s takes the worry out of transferring from Johannesburg to the beautiful Balule Nature Reserve, especially from a solo traveller’s perspective. A mini bus will pick you up from the airport or hotel on the morning of departure and drive you safely to Tremisana, with an hour stop over for lunch. A warm friendly welcome from Ria and the staff at Tremisana made me feel I had returned home. The lodges are clean, comfortable and warm on the chilly nights and the gardens beautiful. The swimming pool is very inviting during the heat of the day. I enjoyed the food so much that I am sure I need to lose a few pounds now that I am back home. The champagne breakfast next to the Olifants River is spectacular. The new Marula Boma slap bang in the African Bush is an absolute delight, just amazing to sit round the brai and look up to the stars which seems to cover the whole sky. Bush Walks were incredible and the Game Drives at the Balule Reserve and Kruger were exceptional, from the big 5 to the little big 5 and all things in between, absolutely amazing sightings. It was wonderful to be back out in the Balule Reserve again, the guides, Wes, Luke, Bongani, Texan and Chris are worth their weight in gold. I learnt so much from them and their knowledge never fails to impress. They are all exceptionally good with the guests and calm in otherwise difficult situations. I refer to a very close encounter with the beloved Zulu, the Black Rhino who definately had plans involving his horn and several parts of the human body. The guides, Bongani, Chris, Wes and Texan managed to divert the somewhat grumpy but beautiful beast attention on two separate Bush Walks and we all lived to tell the tale. If you are looking for a unique African experience, look no further. 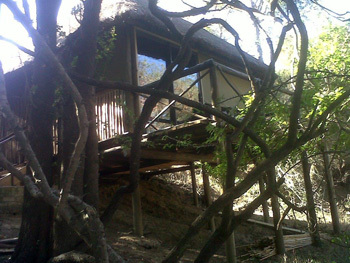 Tremisana Lodge and Marc’s Treehouse are amazing places to stay, each with its own appeal. Thanks to Alice, Ria, Delina, Caroline and the rest of the staff for making my stay a memorable one, also huge and massive thanks to Wes and Luke who’s passion for wildlife and habitats will always be admired and for teaching me about life in the African Bush and how everything out there has a connection. Look forward to seeing you all again, keep safe out there!! Marc’s Treehouse Lodge was one of the best accommodations on my entire trip to South Africa. 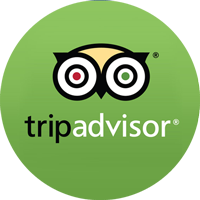 The staff was super friendly and ready to help with everything, and the guides were very knowledgeable. I enjoyed every single morning with good mood and smiles.